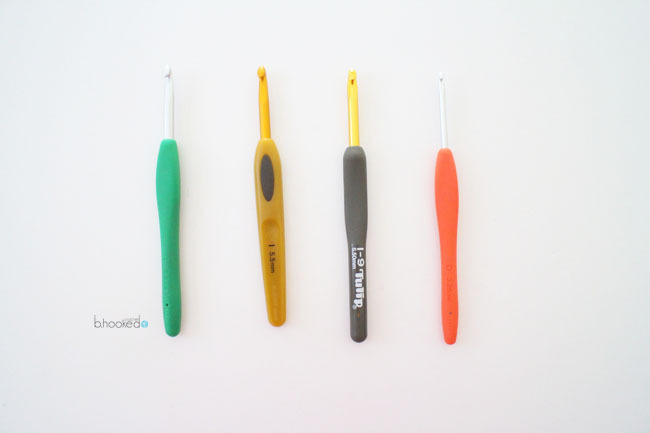 It’s no surprise that crochet hooks are the most important tool we use. Our crochet hook, in many ways, determines the outcome of our entire crocheting experience – enjoyment, neatness, hand fatigue and even gauge. With this incredible influence, we must carefully choose the tool that is right for us. After all, you are only as good as your crochet hook. Aluminum crochet hooks are the material category that ALL of my favorite crochet hooks fit into. I personally love how easily the material glides through each stitch and how lightweight they are. This is the maximum level of comfort and productivity for most crocheters. When your hook glides easily through stitches and it feels as though you’re holding the weight of a pencil, you’re much more likely to crochet for longer and enjoy the experience better. Most (if not all) aluminum crochet hooks have an ergonomic handle as you can see in the image above. This also promotes comfortable crochet binges and cuts down on hand fatigue. 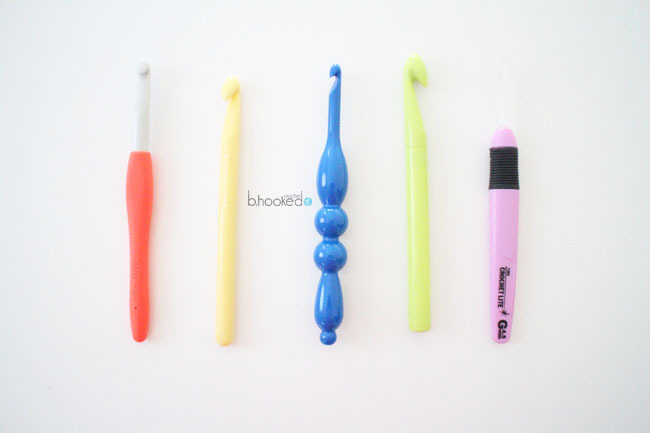 I couldn’t live without my ergonomic crochet hooks. More on that later. My first crochet hooks were of the steel variety. I used them everyday for about a year, until I discovered aluminum hooks. In my opinion, the weight is the biggest draw back to this material. Smaller crochet hooks aren’t too uncomfortable, however, when you use a size 6.5 mm on a regular basis, you feel it. The weight isn’t a huge deal breaker for some. There are many thousands of people using them right this second. 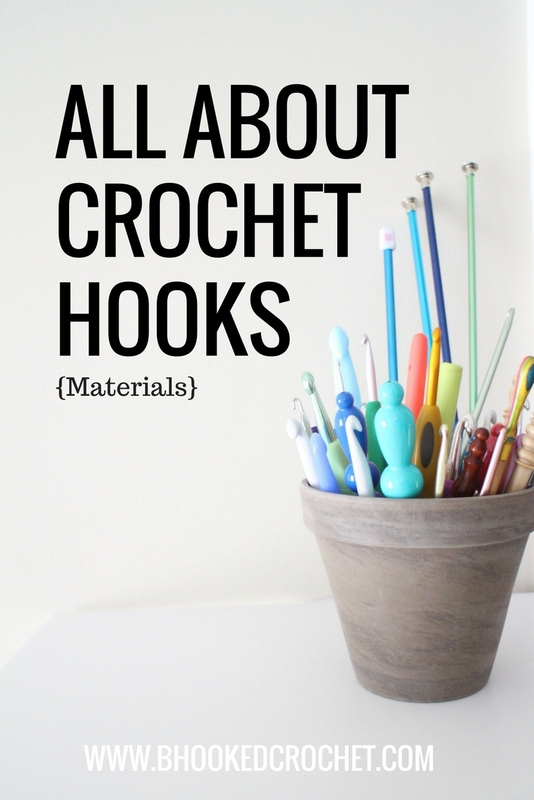 If you’re just starting out with crochet and you aren’t sure if you’ll stick with it for very long, invest in a cheap steel hook. It will get the job done while you decide if this is the hobby for you. Wooden crochet hooks, for me personally, are more artistic than practical. I love the look of a hand carved crochet hook. Just look how beautiful the variety here! You’ll often find me taking pictures with wooden crochet hooks but see me using my trusty aluminum hooks. Wood has slightly more friction than aluminum or steel which requires slightly more effort to use. Be careful not to lose your wooden hooks in the couch or on the ground. They will snap if stepped on! Plastic crochet hooks are my least favorite variety of material. Although the inexpensive and lightweight qualities are great, this is outweighed by level of effort needed to use one. Of the four material types we’ll cover, plastic has the highest amount of friction against the yarn. This requires you to put a little more effort into each stitch. Not my cup of tea. Some people like this quality. It gives them a sense of control of each stitch. You’ll have to decide for yourself! Crochet hook material preference is different from person to person. You can certainly use the information on this page to guide your decision but in order to find the crochet hook that will maximize your productivity and experience, you’ll need to try them all – eventually. My crochet hook collection has grown slowly over the last several years. When I first started out, I used steel crochet hooks and never knew there was a better option out there. 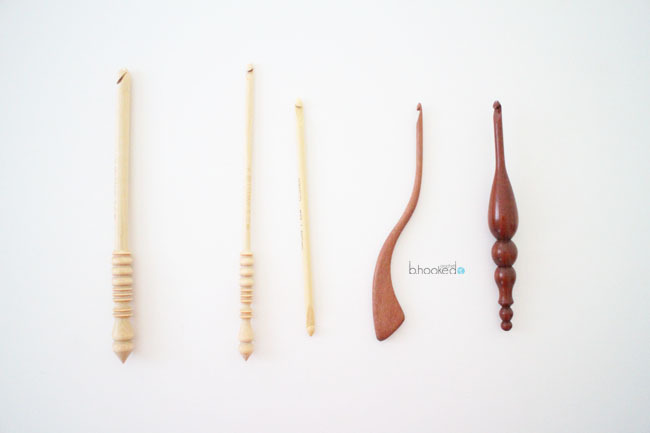 We often stick with the type of crochet hook we begin with. Making the switch from plain steel hooks to my ergonomic aluminum hooks was pretty life changing. So much that I need to tell you about them – again. I talk about my Tulip Etimo hooks a lot here and for good reason. I noticed a big difference in my tension and in my hands and wrists. My stitches were neater and more consistent. I could crochet faster. They look pretty cool too. For me, the perfect crochet hook is the Tulip Etimo. It took me two generations of hook sets to find them but once I did I was, well, hooked. 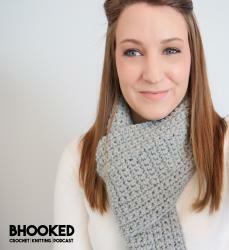 They are lightweight, comfortable to hold and make crocheting effortless. They’ve held up very well to repeated use even after two years. The set I have here came from Amazon. Tulip is a Japanese company and unfortunately, I have not seen these hooks anywhere in stores. I am, however, a big fan of Amazon Prime so I had my set in only two days. If your on the fence about these hooks, feel free to send me an email. I’ll be happy to answer any questions you may have about these hooks. Disclosure: Please note that the links below are affiliate links, and at no additional cost to you, I will earn a small commission if you decide to purchase your supplies online. Please understand that I have experience with these products and I recommend them because I personally use them everyday, not because of the small commissions I make if you decide to buy them online. If you have received valuable information from me at any point, this is one easy way to say thank you for a job well done. Just click on the image below to be directed to amazon listing. 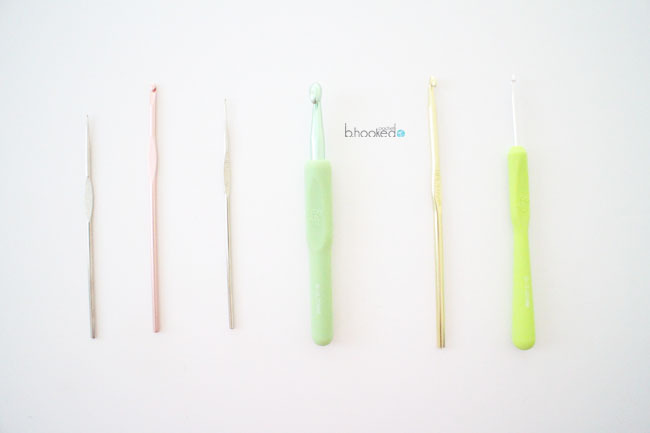 What is your perfect crochet hook? 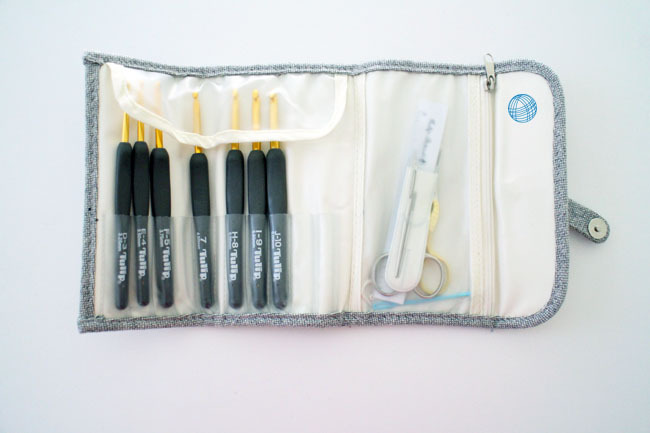 This is the takeaway from this post: what is your perfect crochet hook? Every crocheter has their own personal opinion and experience with each material type and it’s up to you to decide which one works best for you. I recommend purchasing at least one hook in each of the four varieties of material – aluminum, steel, wood and plastic. Complete at least one project with each. That will be enough to figure out which one you prefer. You may even decide just a few stitches in! You can usually tell by the weight whether your metal hooks are steel or aluminum. My Boye hook set is primarily steel and you can feel it! I haven’t had the pleasure of working with an Odyssey hook just yet but heard they are wonderful! I have worked with their wooden hooks and although I loved the grip and look of it, the hook itself is an inline hook which is different than what I’m used to. That’s probably where the awkwardness is from!